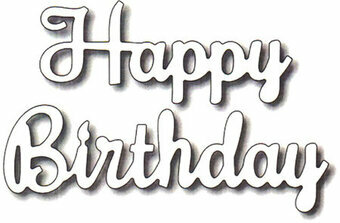 Frantic Stamper Precision Die - Happy Birthday (script). Set of 2 dies. This "happy birthday" set is sure to become one of your favorites. 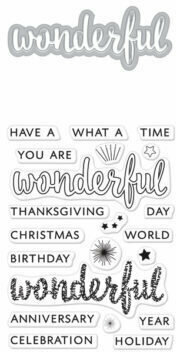 Not only is it sized just right for any card ("Happy" measures 2.3" x 0.875"; "Birthday" measures 3" x 0.875"), but it is perfect to mix and match with other word dies to create custom sentiments. 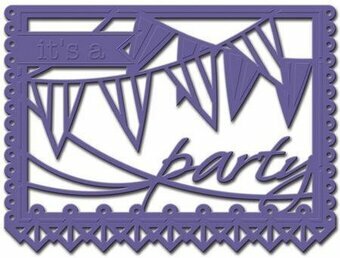 Joy Craft Cutting & Embossing Die - (6pcs) Cake-parts. 6 piece die. Create a wonderful cake design by cutting each piece from a different colour and texture of paper, foam, glitter paper, design paper etc. Size of completed cake is approx. 2" wide x 2 1/2" high. Mix and Match to your heart's desire using these 2 dies and the "Many Happy Birthdays" stamp set (FRAS072). We designed the 2 together so that you can stamp "happy" and die cut "birthday", or the other way around. Either way, you'll get a wide variety of birthday greetings variations to play with. 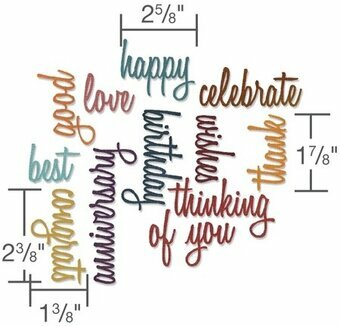 The word "happy" measures 2.375" x 1.5", and the word "birthday" measures 4" x 1.2". Our Frantic Stamper Precision Dies work in most consumer table top die cutting machines such as the Cuttlebug, Big Shot, vagabond, Boss Cut, and Grand Calibur. Use this custom steel die set and complementary ST-15-12 Numbered Balloons clear stamp set to personalize birthday cards, gifts and more. Balloons measure on average : 1/2" x 1 1/4". Made in the USA. Oh Happy Day Elegant 3D Vignettes Collection by Becca Feeken Stamp and Die Set brings both worlds together of die templates and coordinating stamps to give these images life! These cling foam (EVA) rubber stamps are designed to be used with an acrylic block. This set includes five etched dies with 11 stamps. Approximate Size: Stamps: A: 0.7 x 0.6 in. 1.80 x 1.50 cm, It's: 0.60 x 0.85 in. 1.50 x 2.20 cm, Boy: 0.70 x 1.40 in. 1.80 x 3.60 cm, Girl: 0.80 x 1.20 in. 2.00 x 3.00 cm, Your 0.85 x 1.30 in. 2.20 x 3.30 cm, Baby: 1.30 x 0.85 in. 3.30 x 2.20 cm, Happy 1.90 x 0.80 in. 4.80 x 2.00 cm, Congrats: 1.95 x 0.80 in. 5.00 x 2.00 cm, The Big 0.80 x 2.80 in. 2.00 x 4.60 cm, Birthday: 2.10 x 0.85 in. 5.30 x 2.20 cm, Anniversary: 3.05 x 0.80 in. 7.70 x 2.00 cm. This unique elasticated 3D card automatically jumps to life when removed from its envelope. This card is truly collectable and will be treasured for years. This package contains one pop-up greeting card. Opened size: 8.5x10 inches. This design has a blank panel and a gift tag which can be used for a personal message. Can also be used as a balloon weight or table decoration. Poppystamps craft die featuring the sentiment "Happy Birthday". Memory Box/Poppy Stamps craft dies are made of 100% steel. For use on cardstock, felt, and fabric. Cut, stencil, emboss, create! Use in most leading die cut systems. 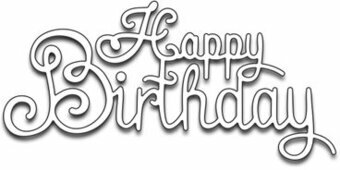 A small birthday greeting that fits just about anywhere. Stencil measures 2-3/4" X 1-1/2". Shapeabilities Baby's Birthday Etched Dies Little Loves by Sharyn Sowell is a silhouette of a child in a high chair, enjoying a birthday treat. Little Loves Collection by Sharyn Sowell is full of moments captured in the eyes of little ones as they experience the wonders of life and first milestones. Approximate Size: 3.01 x 2.86 in 7.70 x 7.30 cm. Necessities Collection A Little Birdie Told Me Die. An elegant collection of high quality steel dies designed to coordinate with each other. This set of 13 dies includes some sweet birds that are perfect for Spring, as well as some handy sentiments including: "A Little birdie Told me", "It's Your Birthday", "Home Tweet Home", "Happy Birthday", "From our nest to yours", and "Tweet Friend". Size Largest: 4.69 x 1.26 inches. Smallest: 0.67 x 0.28 inches. Penny Black Die featuring the sentiment "Happy Birthday".